and you can not dance. You would only be laughed at." What to wear? This age old question has tormented women for centuries. With the JASNA ball only a month away, I know many of you, like me, have been searching your closets and wracking your brains for the perfect ensemble. Since dancing instruction will be provided, we need not worry on that score, at least. While period dress is encouraged for the occasion, it is by no means demanded. It is more important to come to the party than to spend all evening worrying about what to wear. For maximum comfort, we would encourage ladies to wear (longer if possible) full skirted dresses (or a skirt and blouse) and flat soled shoes. A step up from that would be a formal or semi-formal evening wear. Now would be a perfect time to pull out that bridesmaids dress or prom gown you�ve been storing. The basic components of a Regency gown are a floorlength (or slightly shorter) dress with raised waistline, and short (puffed) or elbow-length (striaght) sleeves. Accessories include gloves (elbow or opera length) shawls, fans, and any headpiece you might want to add. Headbands, turbans, feathers, flowers and ribbons were traditionally used. Jewelry of the time included pearls, coral, precious and semi-precious stones. In order to obtain a period appropriate gown, you can purchase a Regency type dress, have a gown made for you or make one yourself. Fortunately, with Jane Austen�s popularity at an all time high, Regency styled dresses have come back into style. Check your local Wedding Gown supplier (like David�s Bridal), Department Store (J.C. Penney and Filenes) or thrift store for an acceptable update. We also have a list of area seamstresses. 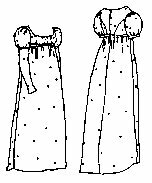 Many seamstresses own Regency Gown patterns already. For those that don�t, a good list is posted at Austentation. You might also like to try Austentation�s Sewing History pattern list. These patterns are available in most fabric departments from Jo-Ann�s to Wal-mart. Fabrics suitable for gowns range anywhere from cotton prints and stripes to silk or satin. Truly authentic gowns are fastened with buttons (preferably covered), not zippers as is suggested in most of the commercial patterns. Try a corset or boned Chemise for that extra bit of "uplift". These can be bought or made - there are many such patterns available on the lists provided. The most important part is to come and have a good time.